BUTTE, MT/CERRITOS, CA (smt)- S-Virginia steam-rolled in the tough ACC winning the regular season and tournament to get the tournament selection committee’s top #1 overall seed with a 31-2 record. Two Big East teams (E-Villanova and W-Xavier) and Big 12 champ MW-Kansas got the other three #1s. This was the second straight year Kansas got a 1 seed despite 7 losses but at least this year they won their conference tournament. The Cavs led the ACC contingent who got a record-tying 9 teams while the SEC got a record 8 teams (was 6) but none higher than a 3 seed (S-Tennessee). The Big 12 got 7 of its 10 teams in (with early hopes for 9) and the Big Ten got four, who played their tournament a week early in order to have their games at Madison Square Garden. That leaves the Pac 12 as the last of the Big 6 conferences and they were treated that way by having their conference & tourney champ Arizona seeded 4th and in the South, two others only getting to the First Four (#11bE-UCLA and #11aMW-Arizona St), and their conference runner-up and tourney finalist USC getting left out entirely despite an RPI of 34 (record for lowest RPI not to make tourney since ’11). Notre Dame was actually the first out and they can blame #12S-Davidson’s upset Atlantic 10 final win over #7MW-Rhode Island for stealing a spot on Sunday. A record five teams had 8-10 conference records and made the tourney (Notre Dame was also 8-10 while USC was 12-6) albeit two face each other in the First Four (Arizona St and #11bMW-Syracuse) and #9E-Alabama was comfortably in despite losing a record-tying 15 games (Vandy in ’17). Five at-large berths were given outside the Big 6 with the American and Atlantic 10 each getting two and the Mountain West getting one. The selection committee (BTW, why the $%#! was the selection show not on CBS???) seemed to emphasize wins equally throughout the season, which is great except that if you lose 11 of 15 games to end a season including the first game of your conference tournament, sorry, #10MW-Oklahoma, you were not deserving of a bid and should’ve played yourselves out of a spot. HOWEVER, for these last at-large bids I’m okay for TV reasons to choose a team with a star player like OK’s Trae Young but the committee should just admit that over whatever baloney they tried to convince TNT’s Charles Barkley with. Quadrant wins were also a factor putting less emphasis on RPI for the first time. But then again, if you can’t schedule teams in Quadrant 1, how could you ever pick up Quadrant 1 wins, so it seems to benefit the big conferences more. I really hope Syracuse’s inclusion wasn’t due to all their complaining about missing the tourney last year. Locally, UCLA snuck into as one of the last four while USC missed the cut after making it as a First Four team last year. #15E-Cal State Fullerton is also in the tourney for the first time since 2008 and will play #2E-Purdue. And for all their fates, even if UCLA wins, they will face #6E-Florida again where they are 0-4 in the tourney (Elite 8 loss ’14, 2nd round loss ’11, Final Four semi loss ’07, Final Four final loss in ’06) so maybe they shouldn’t bother beating #11aE-St. Bonaventure. 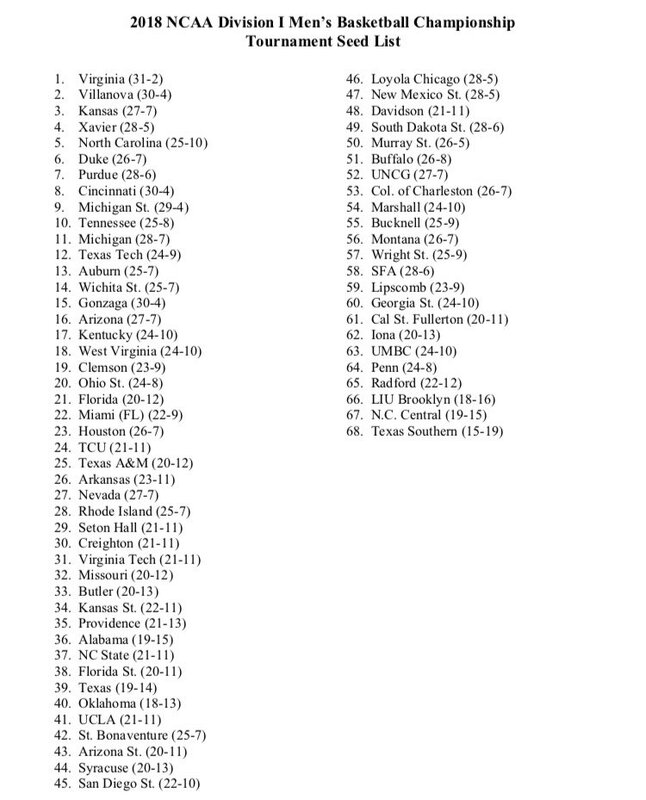 Our HWCI NCAA Pool is our 24th, which celebrates one of my all-time favorite shows, 24. Last year we had a record 171 entries. This is the fourth year we’re fully to our brand new web entry (no more java or Mac issues) and despite all the R&D, the entry fee is still $10 (and although we now accept Google Wallet payments, we do not accept Bitcoins, which have fallen in the past couple months). Deadline is still 9 a.m. PDT Thursday. Same point system. If the winner of any of the First Four changes your mind, then you can either update your bracket or email your change (easier to email one or two changes than resubmit a bracket). So you can pick as early as NOW or wait until the last minute. The only minor change, one no one cares about until the last weekend, is the “Winningest Conference” Bonus. What prints out when you submit your bracket may change depending if St. Bonny’s (Atlantic 10), UCLA (Pac 12), Arizona St (Pac 12), or Syracuse (ACC) wins its First Four game. Since the ACC has 9 teams, the Pac 12 and Atlantic 10 each with 3, it’s possible the Winningest Conference could alter slightly, so we your total may be bumped up if you have either of these teams going past the 2nd Round. You can mail your entry fee (email me for snail mail) or give your $10 (per entry) to someone who will give the money to David or Scott. We are accepting PayPal (check or PayPal funds only) to “hwci<at>hotmail.com” or credit card PayPal payments to “smt0222<at>yahoo.com” (but the entry fee is $10.61 (61 cents in PayPal fees… damn them!)). Now, you can send money via your smartphone an d pay no fees! Use Google Wallet’ Send Money function and send your $10 (per entry) to “smt0222<at>gmail.com” — just make sure you put your NAME and NICKNAME in the notes section. And if you’re having trouble getting your picks in, take a picture of your bracket with your phone and email it to ncaa<at>hwci.com. Last year, Greg Z won the pool in his 4th year. He took home a record $690 getting 29 of 32 correct in 1st round, both finalists, and picking champ North Carolina. Last year we received a record 171 entries from a 124 people. Scott T won the first 30 games in 2017, going 31-1 for the 1st Round. Rick M won the first 23 games in 2017. Two went 16-0 on the first 1st Round day in 2003, One did in 2009, Two in 2014, One in 2016, Six in 2017. Enter online now! You can also fax your entry to me at (720) 368-0816 or email us for a snail mail address (postmarked by Thursday AM). Make arrangements (such as PayPal) to send in your $10 entry fee(s) by March 16th. Complete rules and daily pool information can be found on the official site: http://www.HWCI.com/ncaa. My name is Jack Bauer and this is the longest week of my life. The following takes place between 9 am Monday and 9 am Thursday. Events occur in real time.